Amazon’s Brand Registry program provides security for brand owners who sell on Amazon. To be eligible for Amazon Brand Registry your brand must have a registered trademark in each country of application. The trademark must be in the form of a text-based mark or an image-based mark with words, letters or numbers. With Brand Registry you have complete control over your product pages. You can ensure the correct information is appearing on the page, and still allow other sellers to sell on your page. 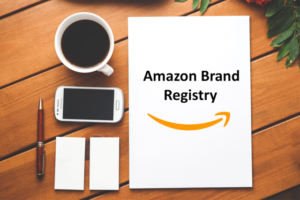 Amazon Brand Registry provides additional protection in case another seller incorrectly uses your trademark. For example, with titles, unauthorised distribution of your product from international sellers and duplicate listings. We help register your brand on Amazon fulfilling all Amazon requirements. We can help you register your brand on Amazon, fulfilling all Amazon requirements. Once you are brand registered you also have access to more tools such as Amazon Amazon Enhanced Brand Content and Headline Search Ads.